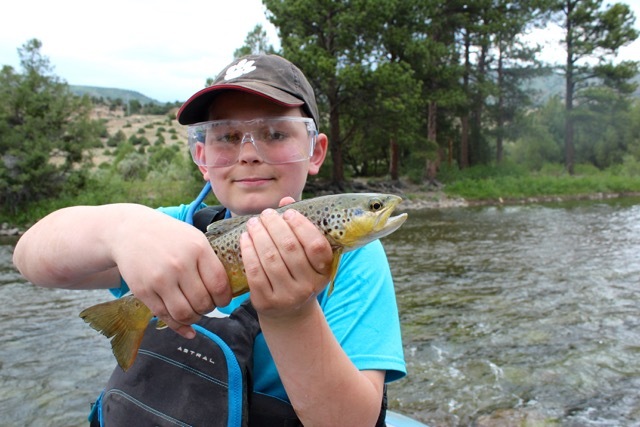 Designated a Gold Medal Fishery in 2016, by the Colorado Parks and Wildlife (CPW), the Upper Colorado River is a must visit fly fishing destination for any visiting angler to Vail, Breckenridge, Keystone, Grand Lake, Winter Park, Grandby, Kremmling, Dillion, Silverthorne, Keystone or even Denver. The Upper Colorado River offer both the wade and float anger an amazing experience. 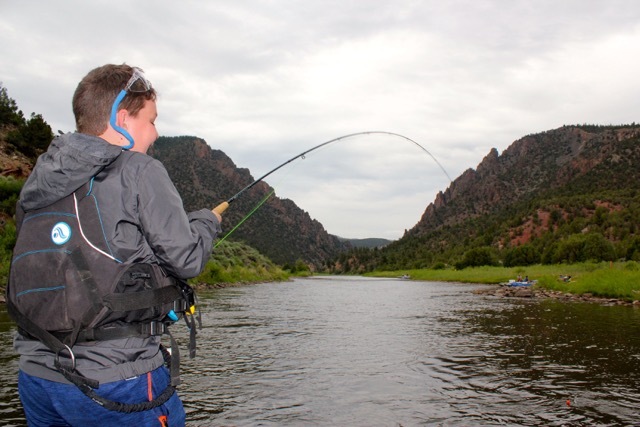 The Float angler has the option of floating the following sections: Pumphouse ramp to Radium (4.5 miles ). This can be done a half day or full day option; 2. Pumphouse to Rancho Del Rio (11 miles) or Pumphouse to State Bridge (14 miles) – both of these are full day options; 3. Radium to Rancho Del Rio or State Bridge – full day options; 4. Rancho Del Rio to State Bridge (4 miles) – half day; 5. Rancho Del Rio to Two Bridges (8.7 miles) – full day. 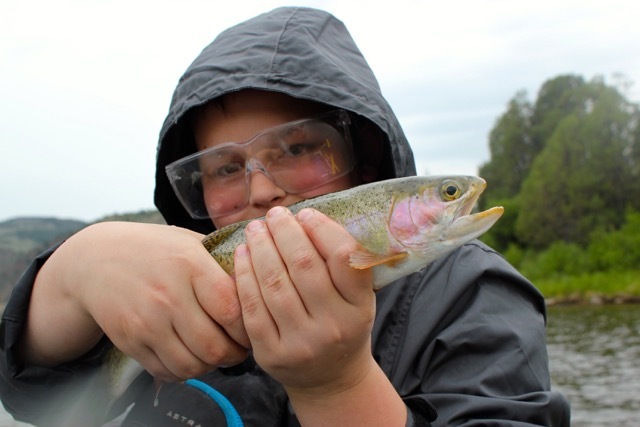 As for wade fishing, we recommend the Pumphouse area and wade locations East of the Colorado River and Blue River Confluence, around and east of Kremmling. June 16 (Saturday), 2018 – Hot flies: Girdle Bug 14, RS2 20, Red Dun 18, Green Caddis Poopah, Green Drak Emerger, Crystal Hunchback. Here is a few photos of a first time angler at age 13. 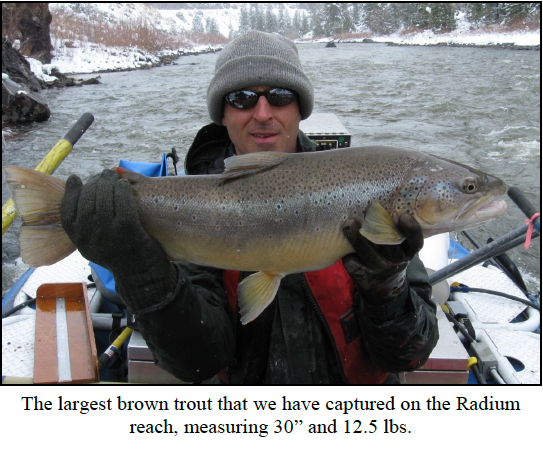 We did not get the photo of his 20″+ brown and trout see below. Upper Colorado River Guided Fly Fishing – caught a big one! In terms of understanding the CPW criteria for a Godl Medal designation, here is their definition: The minimum biological criteria for Gold Medal designation is at least 60 lbs./acre biomass and 12 fish per acre greater than 14”. The Gold Medal designation on the Upper Colorado River extends from the confluence with Canyon Creek (at the mouth of Gore Canyon) to the confluence with Rock Creek near McCoy. 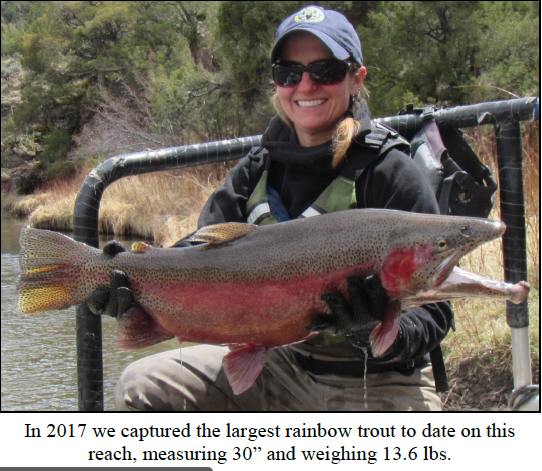 Here is the publication by the CPW of their Colorado River Survey and data from 2010 – 2017.